Fun healthy snacks for kids can be easy to make! This simple treat is easy enough that preschoolers and toddlers can make it all on their own. I recently had the joy of having my 4-year-old niece over for a morning of cooking, and boy did we have fun! I turned our cooking adventures into videos to showcase some easy activities with preschoolers. Check out this fun healthy snack recipe for kids and see how easy it is to put together! Kitchen Tip: Don’t have fresh fruit on hand? Try canned or frozen for a super simple swap! Grab the fun kids knives used in the video here! This delicious snack happens to be pretty delicious for adults as well. 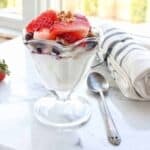 Fruit parfaits make a fantastic breakfast or light dessert idea too! A fun, healthy snack for kids to easily make on their own. Using a kid-safe knife, let your child chop the strawberries. Allow your child to scoop yogurt into a parfait glass, then top with granola and fruit! Don’t have fresh fruit on hand? Try canned or frozen for a super simple swap! Looking for more delicious snack ideas for kids? Check out these ideas! What is your favorite parfait topping?! * There are affiliate links in this post, which means if you were to purchase something it would not cost you more, but I would receive a small commision. Thanks for supporting Create Kids Club! I made this with my 4 year old. He had so much fun and asked to make another!